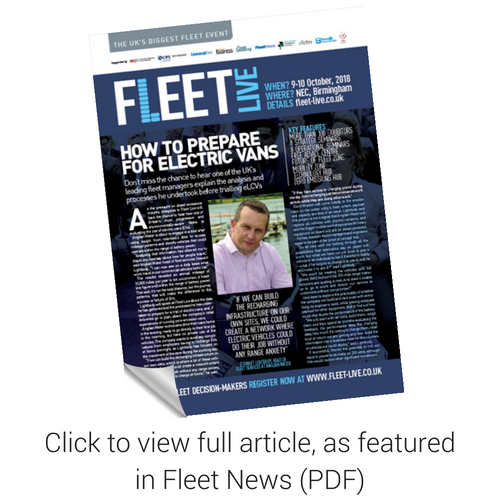 As the pressure on diesel emissions mounts, delegates to Fleet Live will have the chance to hear how one of Britain’s most progressive and environmentally-aware fleets is evaluating the use of electric vans (EVs). Anglian Water is about to engage in a trial after using insight from telematics data to access mileage patterns and identify vehicles that could operate within the range of battery power. “Analysing that information has allowed me to dispel any hearsay about how far people travel,” said Anglian Water head of fleet services Stewart Lightbody. “I can now see on a daily basis what work travel in our commercial vehicles looks like.” The results revealed an annual mileage of 10,000 miles per year is not uncommon, a headline figure well within the range of battery power. That said, it’s not the total distance, but the journey patterns, that will make the difference to the success or failure of EVs. Anglian Water technicians drive their vans home in the evening, ready to go directly to their first job in the morning, but have no private use of the vehicles. The company wants to avoid any complications from employees having to recharge EVs at home overnight, so Lightbody has focused on the movement of the vans during the working day. “If we can build the recharging infrastructure on our own sites, which is where a lot of these vehicles visit, then we could create a network where EVs could do their job without any range anxiety, and without having to charge at home,” he said. Electrification will come initially to the smaller vans on the water utility’s fleet, where payload and capacity are less of an issue. Lightbody said this project is not a signal that Anglian Water will replace all vehicles with electric versions, and said the bigger mobile workshop vans with heavy equipment on board will still be diesel-powered. He has, however, found managers and engineers eager to be part of the ‘proof of concept’ trial. He’s keen to explore the practicality of whether the company can build and rack a van with everything its engineers need, while leaving adequate payload for other equipment. And to find out how much that blunts the performance of the battery. “We will start with six vans, build them, weigh them and then spend six months evaluating the feedback, the performance data, the charging data, how much it’s costing to charge them, what kind of return we are getting and then build the information into a business case for the volumes of vehicles we could deploy,” said Lightbody. If successful, there’s the potential to roll out electric power to as many as 200 vans, although this would involve other significant investment. Hear Stewart Lightbody speak at Fleet Live about the data he has gathered and the processes he has undertaken to prepare for a trial of electric vans, and, if deliveries go to plan, about the company’s initial experiences of running zero-emission vans. Click here to download the latest agenda.